Last month, Hulu began talking about a new form of advertising it had in the works that it called "pause ads." At the time, the company said it tested numerous versions of the format, but they all boiled down to showing subscribers some form of advertising every time they hit pause on a video in Hulu. The final version of pause ads has now been decided, and they'll begin rolling out in the second quarter of 2019. When they do, pause ads will not play video or audio when you pause a show or movie in Hulu, but instead they will showcase static images with taglines from various brands. Just as consumers’ viewing habits have evolved, their expectations for advertising have also changed. Viewers no longer accept an irrelevant, intrusive ad experience and appreciate when brands tell their stories in authentic and integrated ways. To stand out and continue engaging their target audiences, brands must rise to the challenge and flex their creative muscles to go beyond the traditional commercial break. Enter Hulu’s new Pause Ad, which provides a non-intrusive, viewer-initiated ad experience that is both delighting to viewers and effective for brands. Hulu says pause ads will be "contextually relevant" and have background gradients that change to distinguish the ad from the paused scene. 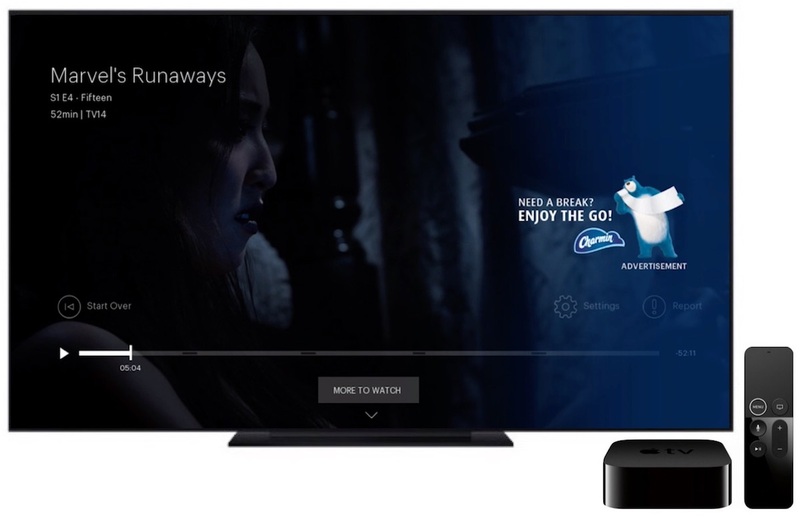 The company calls the ads "non-disruptive", and the final form was decided upon after extensive user testing found that consumers preferred ads that don't play extensive audio and video when pausing movies and TV shows. The first two brands to debut with pause ads will be Charmin and Coca-Cola. When pause ads roll out they will appear within "select content" in Hulu's streaming library, presumably for those subscribed to Hulu With Limited Commercials. In today's press release, an example of a pause ad is shown in the Hulu Original show Marvel's Runaways, so it appears that even Hulu's own original content will have the new ads. The title of the story, the image, AND the text of the story all contradict this. You're 0/3. What an absolute crock. Ads aren't an experience or "delighting to viewers". They're an intrusion, however you try and spin it. "...pause ads will not play video or audio when you pause a show or movie in Hulu, but instead they will showcase static images with taglines from various brands." It's fitting that Hulu considers Charmin a "contextually relevant" sponsor for their offerings. I'm not a Hulu fan by any means (I see it as legacy TV trying desperately to keep a toe-hold as the industry moves on) but my partner subscribes. Maybe this will end Hulu in our household entirely. I don't see much of an issue with it. Whether you're looking at a paused image of the show you're watching, or a picture of toilet paper, it shouldn't matter so long as you're not missing the show while you're waiting for your popcorn to microwave. What I REALLY, REALLY wish Hulu, and others like it, would do is SELL MORE ADS. Seriously. These streaming apps each seem to have less than a dozen ads that they cycle through over and over and over again. I mean how many times can I see the same gaggle of hipsters walk into a room where they are amazed by the same lousy collection of Chevy SUVs hiding behind a wall? I get it...Chevy is swell. Move on. I'm going to go under the assumption that those of us paying $12/month for the no ad Hulu plan will not see these "static ads?" Yeah, you have the option to pay for add free content on Hulu so the choice is yours. This new thing doesn't bother me if this means that you use up the allotted ads in pause mode and reduce the ads when actually watching. What you don’t know is this isn’t the new F-150 it’s the new Silverado! But really, a static ad when I pause is not a big deal, I’m going to do something away from my tv if I’m pausing it anyway. I wouldn’t even mind a static ad in the corner of the show if it meant no full on interruptions. Unless part of the reason you are pausing is to look at something on the screen, which might now be covered up by an ad instead. It's OK to be the first post. Not OK to get it wrong.